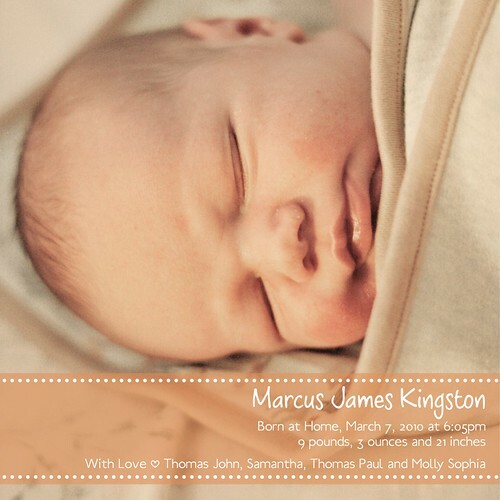 Marcus James is here! (and a Baby Steps EC Pattern Giveaway) Winners Announced!! Congrats Claire, Sheryl and Erin! Hope you enjoy your pattern! To celebrate becoming a mom of THREE, and releasing the new Baby Steps EC Pattern, I am giving away the new pattern to THREE (3) lucky ladies (and guys too, equal opportunity sewer here)! I made Molly’s Birthday dress right before Marcus was born 😉 I sketched up what I wanted it to look like and went to town, cutting into some pj’s that I bought awhile back. I think it looks close enough to my chicken scratch attempt at a picture. Ummm… it was 3am. No entries after 2:34 am Mountain Time Tuesday, March 30, 2010 (When Molly was born three years ago!). Winners will be selected at random (using random.org) and announced Tuesday morning. « February is going to be a busy month! 55 Comments on Marcus James is here! (and a Baby Steps EC Pattern Giveaway) Winners Announced!! Congratulations on the new baby and the new pattern! 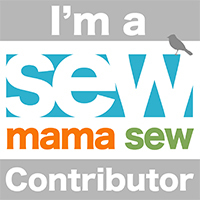 What was the last thing you sewed? The last thing that I made was a flop eared bunny that I made from organic cotton fabric. Did it turn out like the picture? The picture on front of the pattern package was drawn and not an actual photo but the finished product resembled the drawing fairly well. LOL!!! I love this question! It was about 1pm after lunch on a Sunday afternoon when the baby was asleep. I know that you aren’t offering extra entries for spreading the word but I did blog about your giveaway. All the best and congrats on your new baby. The last thing I sewed was some diapers for my son. I made both Little Starters and Fattycakes – both turned out just how I wanted and are now my favorite diapers in our stash. Congrats Sam!!!!!!!!! The last thing I sewed was a One Size Diaper. I finished it at 9:55pm last night just in time for the 10pm diaper change, and last nursing of the day…. The last thing I sewed was also a weighted blanket!! How funny is that?! It came out NOTHING like the pattern I was loosely following because I figured out a better (or so I thought) way to do it. It was two nights before we left Idaho to move to Germany. We ended up not even taking it on the plane with us, but it came & has been well loved even though it isn’t my best work at all. I finished it about 2:15am, just when Elizabeth woke up to nurse back to sleep & just in time to tell my husband goodnight/goodmorning (it was 10am in Germany). Congrats on the beautiful baby and new pattern. Congrats on your precious new arrival and his home birth. The last thing I finished up was a Feliz dress for my youngest daughter. I finished it up around 11 am. (when I started, well thats a different story lol, few weeks ago!) congrats on both parts, he is precious! “What was the last thing you sewed? The last thing I sewed was a La Di Da diaper in a newborn size. Did it turn out like the picture? Yes, but even cuter. What time was it? During one of babys evening naps. Yay! Congrats on your new baby and I’m so exited for the giveaway! The last thing I sewed was some trainers for my DD. They turned out just like the picture, except I got the waist elastic a bit too snug. Oh, well, as it turns out she just wants to wear her brother’s Star Wars undies! I finished the last one around 10p Sun night. The last thing I sewed was matching dresses for my daughters, the first one was form a pattern and yes, it turned out like the picture and the second one, I made up as I went along and yes it turned out the way I pictured it. It was 3:15pm when I finished the last one, right when my aunt called to stop by. Congratulations!!! He is such a cutie!!! The last thing I made was Jade’s Halloween outfit (she was a Russian doll) from pieces in Ottobre. It did turn out like the pictures but she doesn’t wear it much b/c it has snaps and she’s a stripper. 😉 I finished it up about 6:30pm on Halloween night (the last of the shoes) but the regular clothing part I finished at 10pm the night before. last thing i sewed was a diaper for a special friend 🙂 it was the middle of the day, and it came out just right! The last thing I sewed was a travel wetbag that snaps onto my diaper bag. It was easy peasy, and turned out exactly like the picture in my mind. I finished it at 11:43am- my mom called right as I was finishing it, to let me know that she was on her way to pick the kids and I up (we went to Trader Joes and Whole Foods, hence the reason I *needed* 😉 the travel wetbag). The last thing I sewed was an Imke shirt from the book Sewing Clothes Kids Love. It turned out super cute! And pretty sure it came out how it was supposed too! (THe book is lacking when it comes to actual pattern pics IMO…). It was 11am, on Sunday morning. holy moly! he is gorgeous!! 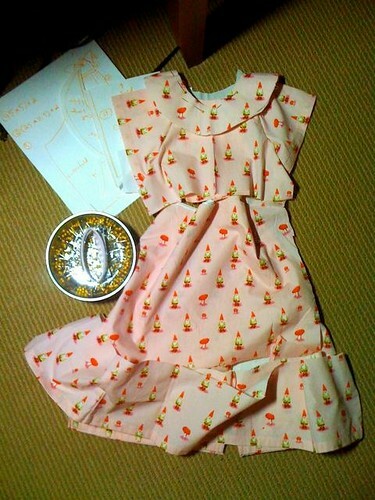 And that birthday dress, wow!!! the last thing I sewed was a pants muslin for me, and no it didn’t turn out like I thought it would because they didn’t fit 🙁 I do intend to keep trying though. Oh my word he is sooo stinking cute!!!! Congrats to you and your family!!! The last thing I sewed was a Hedgie Dress for my little girl for our trip to the woods… It was a self drafted pattern from something I saw on etsy… took me three tries to get the right size and the arm bands were a mess, but it turned out great and she loves it… it was just after 2am when I finished it! “What was the last thing you sewed? I sewed baby legs out of some crazy monster toe socks. Super fun! Marcus is a beautiful baby! Congrats!!! The last thing I made was A Very baby snug wrap for a baby shower gift. It turned out exactly like the picture on the pattern. I finished it at 3:45, which gave me 15 minutes to get to the baby shower. Talk about procrastination. The last thing I sewed was a quilt that I just finished piecing today. It turned out quite nicely, though far from perfect, as I’m not a regular quilter. 🙂 I finished the piecing around 1pm today. Wow, that dress you made is amazing! Congratulations on the new pattern. How do you find the time? The last thing I finished was a swimsuit and it looked like I envisioned, but it was heavily modified from the pattern so not like the picture. I think I finished before 11pm the night before I needed it. Then I had to throw it in the wash. Only problem, I fogot to sew down one elastic on the leg. Weird, and I was already at the pool getting ready when I noticed. Still haven’t finished it. Congrats Mama! That is one beautiful baby! The last thing I sewed was a 12×12 inch friendship star quilt block for Asher’s big boy bed. 🙂 2 down, a million more to go! It did turn out just like the picture. 🙂 I’m happy! It was around 3pm when I finished that particular block. Two New conception baby essential outfits for the new baby. They are both long-sleeved shirts and pants. Did it turn out like the picture? Yes! I love this pattern because it is so easy, I can do almost everything with my serger, and the fit is great. This last Sunday, March 20 around 2 pm. Congrats on your new little guy and his wonderful birth! Oh So squishy and cute! Congrats he is SOOOOOO beautiful!! The last thing I sewed were some newborn diapers for the new bean. They turned out quite well. These were done over the course of a few days. I would love to win this pattern. I tested the size large for Mr. Bryant and the fit is great! A Sprout Snap diaper, and I am working on the 100 Dreams dress. What time was it? It is always REALLY late or REALLY early. My kids won’t let me sew when they are awakes. The last thing I finished was a NB Ottobre outfit for the new baby born next door 🙂 It came out every bit as well as I’d hoped it would, and was seriously soft & cuddly 🙂 I finished it at 2 am, night before last lol. The last thing I made was the Black Apple Doll from the Martha Stewart site. My ODD lost her 1st named doll, and this pattern was the closet I could find. It turned out “close” to the picture, b/c I modified it a bit. The arms and legs had you using the same fabric for legs and hands, so I changed that out, so the doll would look more real. It was Monday night at 10pm when I finished with her. And my DD woke up next to her in the morning, and was in LOVE–“My New Natalie doll!! !” Wow, it wasn’t my bast sewing job, but it sure made her day!! Congratulations on the birth of your 3rd child! Hope you are able to get some rest. He is very cute and looks so peaceful. The baby blanket atop baby Marcus is adorable, did you make that? The last thing I sewed was an itty bitty newborn hat. Congratulations on the new baby (he’s scrumptious!) and the new pattern release! The last thing I sewed was a pair of pajama pants (I was finishing up 5 pairs) out of scrap fleece for my son. They turned out like the picture except that a few days later I found a hole where I didn’t serge quite close enough on the waist line. =) I finished them at 8 pm, 5 minutes before he went to bed. Congrads on the new baby! The last thing I sewed was a nightgown/dress it can go either way. It turned out just like I wanted didn’t use a pattern just took a adult shirt and modified it. Now I can’t get her to take it off. The last thing I sewed was a 4th of July Itty Bitty Baby Dress from the pattern from Made by Rae, for our newest addition this summer. I think it turned out like the picture…though maybe not if you look close. 🙂 Most of it was done during the day, but I think I finished around 9-10 p.m. since I had to go to the store and buy bias tape for the hem. The last thing I sewed was a pair of brown pants for my 9 year old. They are just pretty plain pants (a Kwik Sew pattern), but they turned out well and fit perfectly! I forgot about the “what time was it” part of the question…I don’t remember other than it was daytime. I actually had to look at my serger to see what color thread was in there to try to remember what I had made most recently. Even though it was only a week or so ago. I’m pretty forgetful! The last thing I made was a 13″X13″ security blanket. It had flannel on both sides and the edges were cut in rag form. I made it last night at 7:30 and it came out like I planned (from the picture in my head). The last thing I made was a fitted diaper for my 6months old daugther. I made it between 3 and 4 pm, on monday march 23rd 2010. It was a Little starter in size small. I serged it and kept it closure free as I wanted to try it on my DD before deciding on closure. It did look good, especially when DD tried it on with a snappi, almost as good as on the pattern picture. Almost because I still have trouble when I try not to catch the elastic while serging. This pattern is so quick to sew, especially when serging. Now I want to try it T&T, and maybe with aplix. It sounds like you are a night owl just like me. The last thing I sewed was the button back on my favorite pair of pants (I sew plenty of other things besides buttons, but that was the last thing I sewed!). Yes, it did turn out just like I pictured and remembered it in my head! 🙂 It was just early in the evening when I completed my project – 11:30pm. The last thing I sewed was the size large Little Comet Tails Yoga Pants without the booty. I suppose it was about 9:30 pm, after the twins were asleep, and before my eyes became too droopy! While we got lots of hand me downs, the jeans don’t fit over cloth diapers very well, so in comes LCTs! Sadly, I made the size too large… I guess I’ll have another late night (well, hey, with twins 9:30 is LATE for me) soon. Congrats on your new little bundle, he’s so precious! Congrats! He’s so adorable! The last thing I made was a dress for me! My first one! I used a tutorial so it (surprisingly) came out very well. I think it was around 10pm when I finished – not too bad. All my sewing happens after the kids go to sleep and usually finish a project around midnight!! The last thing I sewed was your marvelous Little Half Moon diaper, and yes, it turned out just as instructed! I T&T’d it just today while my daughter had her mid-morning nap! last thing i sewed? 24 prefitteds. they did not turn out like the picture, but they are functional. i think i need more practice! btw, congratulations on your new babe! The last thing I sewed may have been an inconsequential seam to secure the edge of some socks I cut down to make baby legs. The last substantial thing I stitched up was the Ottobre Designs free diaper pattern. Both items were finished either late at night or during naptime, since my little man won’t let me sew while he’s awake. Since there wasn’t a photo I can’t say whether it looks like it was “supposed to”. I just finished a set of NB Little Starters, and I was about to get started on some Tighty Whitey Hipsters! The LS look like the pic, except I skipped the casing on the elastics and just topstitched the wings. ‘Cause I’m lazy like that. 😉 I finished about an hour ago! 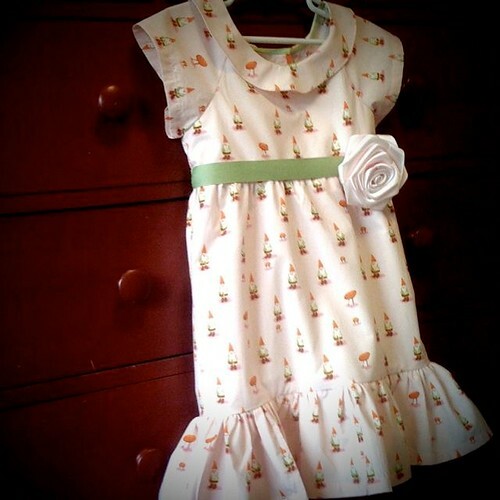 The last thing I sewed (or am sewing but almost done) are my girls Easter dresses. So far, my oldest DD dress looks amazing. I thought my youngest daughters dress looked great until I attempted my first zipper. They are almost done so I’m hoping no one notices my flaws. You little man is adorable and you are so brave with the home delivery. Great job!